Today BURGER KING® restaurants introduce a sweet new treat with one of America's iconic cereals, the Cinnamon Toast Crunch™ Shake 1. 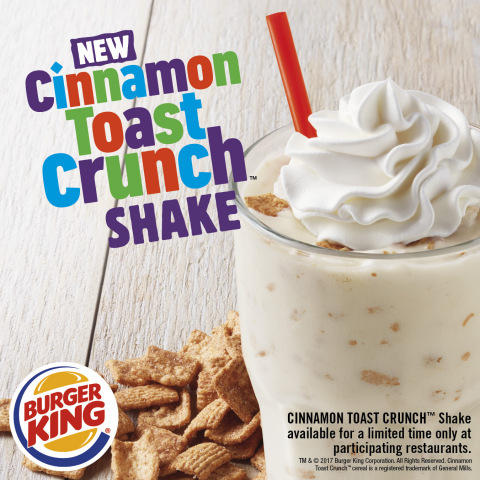 Today BURGER KING® restaurants introduce a sweet new treat with one of America's iconic cereals, the Cinnamon Toast Crunch™ Shake 1. Available in participating restaurants, the hand-spun shake blends velvety vanilla-flavored soft serve, sweet syrup and Cinnamon Toast Crunch™ cereal into a cup of cinnamon swirl bliss. "Our cereal shake mashups have been a big hit with our guests, and we want to continue providing tasty, exciting shake options for them," said Alex Macedo, President, North America, for the BURGER KING® brand. "Hand spun shakes are an iconic part of the BURGER KING® brand history, and we know our guests will love this sweet menu addition." The Cinnamon Toast Crunch™ Shake is available for a limited time only at participating BURGER KING® restaurants nationwide for a recommended price of $2.99. About BURGER KING®Founded in 1954, theBURGER KING® brand is the second largest fast food hamburger chain in the world. The original HOME OF THE WHOPPER®, the BURGER KING® system operates more than 15,000 locations in approximately 100 countries and U.S. territories. Almost 100 percent of BURGER KING® restaurants are owned and operated by independent franchisees, many of them family-owned operations that have been in business for decades. The BURGER KING® brand is owned by Restaurant Brands International Inc. (TSX,NYSE:QSR), one of the world's largest quick service restaurant companies with more than $27 billion in system-wide sales and over 23,000 restaurants in more than 100 countries and U.S. territories. To learn more about the BURGER KING® brand, please visit the BURGER KING® brand website at www.bk.com or follow us on Facebook and Twitter.